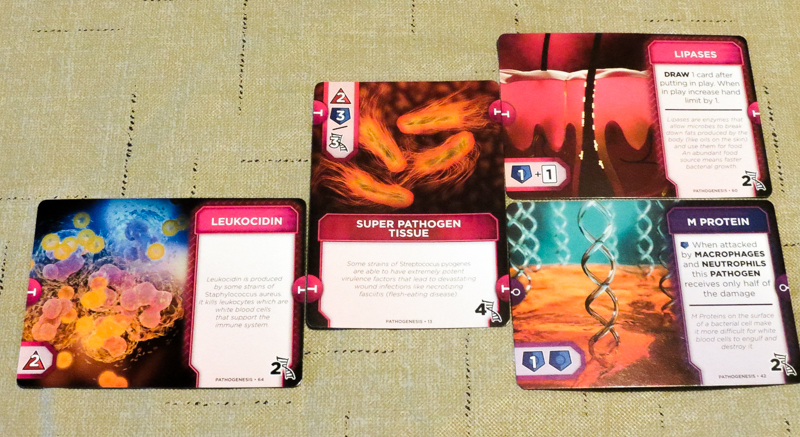 This Pathogenesis review is based on one solo game, three co-op games, three competitive games, and two 2 vs. 2 team games. 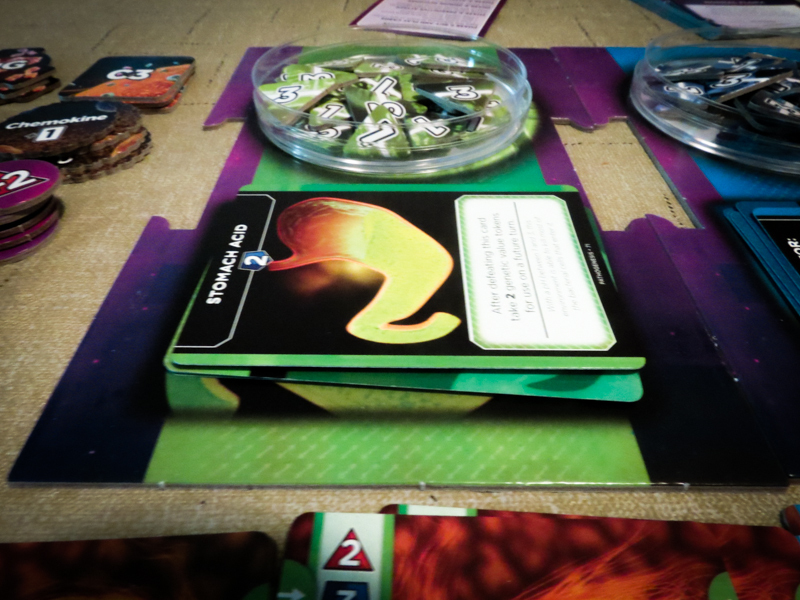 Pathogenesis is a deck building game in which you play the part of bacterial pathogens attacking a human body. Your job is to do enough damage to the body before it becomes immune to every pathogen that comes its way. Pathogenesis was designed by Loren Cunningham and Jamie Cunningham, and it’s published by WIBAI Games. 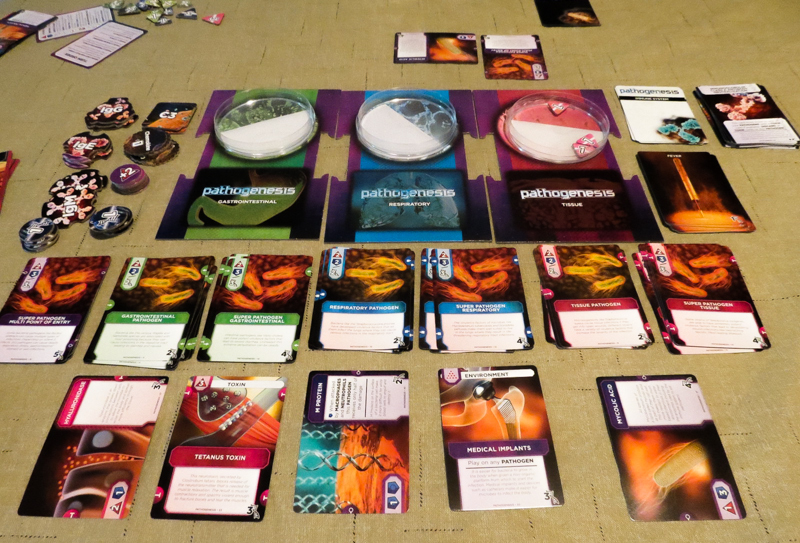 Pathogenesis has four game modes – solo, two-player cooperative, competitive/semi-cooperative, and 2 vs. 2 team play – but they play pretty similarly. Here I’m going to tell you about the basics of the game before going over a few differences between the four game modes. You’ll begin each game of Pathogenesis with a starter deck of cards. This deck includes some starting pathogens and some New DNA cards. The pathogens are what you’ll be putting on the table so you can attack the body. If you don’t want to use them as pathogens, you also have the option to use their genetic value, which is the currency in the game. The New DNA cards are worth one genetic value apiece, but they also have two other uses. You can use them to discard a card from the Active Gene Pool, which is where you buy the cards to make your pathogens stronger. You can also trash the New DNA cards to use their special abilities, allowing you to get the benefit of the ability and thin out your deck. Throughout the game you’ll be attacking one or more of the body’s three tracts. You’ll first have to attack each tract’s barriers by going through their decks of cards. Each barrier card simply has a defense value, so if your pathogen’s attack value is equal or higher, you’ll discard that barrier card. When you do defeat a barrier card, you’ll get genetic value tokens equal to its defense value, which help you to buy better cards in the future. After you’ve fought through a tract’s barrier deck, you’ll be able to attack the body directly in that tract, removing damage tokens based on how much damage you do. Unfortunately, after the first barrier is taken down, the immune system is going to start attacking your pathogens before they get a chance to attack. You’ll draw one Immune Response card for each pathogen you have in play and check to see if your pathogens have enough defense to survive. Any pathogens that do survive will then attack. The starter pathogens are not good enough to win the game on their own. You’ll be able to buy new pathogens or upgrade the pathogens you currently have in play. When you buy new pathogens, they go into your discard pile and you’ll be able to draw them later. When you upgrade, you’ll replace a pathogen with a new pathogen, attaching any of the cards that were on the old pathogen to the new one; the old pathogen is then removed from the game. Throughout the game you’ll be using your cards’ genetic values and the genetic value tokens to buy new cards from the Active Gene Pool. The Active Gene Pool consists of more powerful pathogens, as well as toxins, traits, and environment cards. Traits can give you attribute bonuses and special abilities, toxins give you the biggest attack boosts, and environment cards give you immediate abilities and are discarded at the end of your turn. Toxins and traits are attached to pathogens when they’re put in play. As you upgrade your pathogens, you’ll have more attachment points at your disposal. There are tract-specific pathogens, which can only bind to matching toxins and traits, and there are multi-point pathogens, which can bind to any toxins and traits. In all four game modes, you’re trying to take down a certain amount of tracts before the Immune Response deck is depleted. You’ll have to take down one tract in the solo and competitive modes, two tracts in team play mode, and all three tracts in co-op mode. In the competitive and team play modes, you’ll be collecting the damage counters that you’ll gain when attacking the body. Whoever ends up with the most counters wins. In all four modes, everyone loses if you need to draw an Immune Response card and none are left. That’s a pretty basic overview of how to play Pathogenesis. If you want to learn more, check out the official rulebook (PDF). The theme! I’m pretty sure that every action, interaction, and ability in this game makes thematic sense. It’s obvious that a ton of work went into making Pathogenesis. The artwork is fantastic. I didn’t know anything about somersault1824 before I saw this game, but now I’m a fan. The images pop off of the cards, making it that much easier to get into the theme. Upgrading pathogens is a nice little twist on deck building. It’s really cool that you have this option to upgrade your cards immediately and thin out your deck at the same time. Decisions are pretty much never obvious. Do you upgrade your pathogen now or do you buy that expensive trait to try to get it into your hand as quickly as possible? You have a lot more control in this game than in many other deck builders out there. All four game modes work equally well. I like that there are only minor differences between each mode. It’s also great that the designers made setup guides for every game mode available. They have deck and tract setups for multiple difficulty levels, and they even included “quick” and “long” game setup information. Pathogenesis stands out because of its theme, which means that people who can’t get into the theme might not like this one as much as other deck building games out there. The deck building alone might not be enough to draw people in. Unfortunately, the cooperative mode can only be played by two players. I’d love to see them add some setup instructions for three and four-player cooperative games. I won’t complain too much about this, though, since the “competitive” mode basically is semi-cooperative. If the science theme in Pathogenesis interests you at all, I highly recommend checking out this game. I have taught this one to five people who had never heard of it and all of them have become fans. In fact, if it allowed for three and four-player cooperative play, I’m pretty sure it would eventually end up on our Top 5 Deck Building Games list. We really have enjoyed it that much. 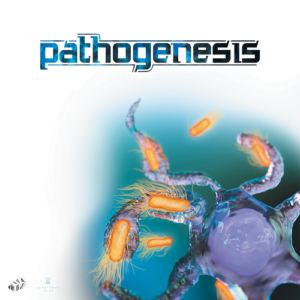 Thanks for taking the time to read our Pathogenesis review! and thank you to WIBAI Games for providing us with a copy of this game.